Although not the most pleasant medium to work with this can be very rewarding for the coleopterist. Within a short time of being deposited, especially if the temperature is high, most types of dung will attract lots of beetles. Probably the easiest way to observe specimens is simply to break the surface of the sample so that the aromas are released and wait for them to fly in; sweeping the many insects that will soon swarm around the dung will provide a range of species. The vast majority of specimens will be scarabaeoidea, hydrophilidae and staphylinidae although others eg. Monotoma and histerids will soon be found. Some species will occur in large numbers eg. Aphodius prodromus (Brahm) or A.sphacelatus (Panzer) may swarm in their hundreds above a disturbed sample. Different species fly at different times of the day; Geotrupes spp. may be seen flying in hot weather but become most active during the evening, Aphodius rufipes (Linnaeus) fly during dusk or sometimes at daybreak, often in large numbers. Many species come readily to m.v. light eg. Aphodius fossor (linnaeus) and many Cercyon species. Simply observing a dung sample for a few minutes when the weather is hot can be very productive as some of the larger staphs move very quickly when disturbed or alarmed and seem to simply vanish, Philonthus spp. and Creophilus are like this, and Ontholestes spp., as well as moving very quickly are difficult to hold onto. Disturbing a sample too quickly may therefore be counter productive. Dung pasture will usually contain an abundance of samples so it does no harm to disturb a few and to see what flies in. Sometimes the number of specimens is huge eg. when Oxyteline staphs are swarming a few sweeps of the net will produce hundreds of them. In this case several of the common ones will soon become familiar and recognised instantly eg. Anotylus rugosus (Fabricius), Oxytelus laqueatus (Marsham) or Platystethus arenarius (Fourcroy), these can then be noted and then more interesting stuff looked for. The same goes for Cercyon species, a group that is initially difficult to identify even under the microscope, but again with a little experience of observing them in the field most specimens can be assigned to a few common species eg. Cercyon haemorrhoidalis (Fabricius), C. melanocephalus (Linnaeus), C.quisquilius (Linnaeus) or C. lateralis (Marsham). Be assured that this familiarity will soon be gained because at first when working with dung there can be so many specimens that you become overwhelmed and wonder what is worth taking. At first take small samples of things that look as though they might be identifiabe eg. Aphodius and larger histerids or staphs, and then as experience is gained most of these, beyond being added to the field notebook, will be ignored. The variety of species will not be immediately obvious eg. several Aleochara species look similar and it is unlikely that the Sphaeridium you see will all belong to the same species, this kind of thing will become obvious with experience. Most of the dung on Croxley moor is from cattle i.e. ruminant dung, and while fresh samples are only useful for what can be netted above them, a range of samples of different ages can always be found and workable ones i.e. dry enough ones, can be used for sampling. There really is no advantage in trying to work through fresh ruminant samples as anything present will very probably be netted around or found amond older samples. As an example Sphaeridium species are very common in fresh ruminant dung and move fast, literally swimming through the sample, and so can be difficult to remove, on the other hand they are also common under older samples that have dried out and can be turned easily. In general the need to work fresh ruminant dung should not arise. The astonishing thing about dung is how many beetles it can contain and, equally so, how many of these will not be seen as you work through a sample. To fully appreciate this you will need to extract the specimens. Unless you have a convenient water source as eg. the river on Croxley moor, you will need to take the sample home. Choose carefully where to perform the following operation as it can be unsociable, even disregarding the smell; I once turned up at a friend's place soon after a sample had been extracted and it was immediately obvious that the layperson might not appreciate hundreds of staphs etc. around the windows and on the walls. The method we use is to submerge the sample in water and wait for the beetles to float to the surface, which they always do and usually fairly quickly. The sample may need to be weighted down preferably with a large gauge wire mesh to avoid it floating (especially horse dung), do this first and then pour the water gently down the side of the container so that the sample does not fragment or the water discolour too quickly. If this is done carefully the water will remain clear enough to allow identification of many species, this is made easier by the fact that when submerged the elytral colour and patterns are much bolder and easier appreciated, ideally the specimens should be transferred to a shallow tray of water placed ready under a low power (X10) microscope; one of our members 'borrows' a white gratin dish and metal stock strainer for the occasion. Staphs will leave the sample and fly at the first opportunity so some method of retaining these will be needed. We use a twenty litre bucket and, while we have never needed to try this, it seems straightforward enough to fit a wire framework and netting over the top to catch the specimens, this may also negate the need to extract the samples indoors. Failing this a shed with a bright window is ideal. Other methods of extraction eg. Berlese funnels have not been used because dung species are generally active enough to be found by the above methods, even the smallest staphs and Cercyon spp. are soon spotted in a white tray. Fresh samples are undoubtedly the most productive, on a hot day a sample of a few litres will provide all the specimens needed to become acquainted with the subject. We take samples of about four litres and bring them back to the workshop in a sealed bucket. About half a bucket of horse dung was collected weekly from the same 200 metre stretch of the bridleway that circumnavigates Whippendell wood. The numbers of each species present were recorded and these are the figures displayed in the green squares on the above table. Some columns are blank this is because on a number of occasions, cricket tour, boat blacking etc, recording was not possible. The results are interesting and will prove more so should we have the opportunity to repeat the procedure in subsequent years either in the same locality or elsewhere eg. on the dry pasture of Croxley moor. The value of preserving such results should be obvious �. Including other species will add to the work but once some of these become familiar things get easier and the results are obviously more valuable. For the amateur coleopterist such studies are fascinating and educational, the vast majority of specimens can be released unharmed and any interesting ones retained for reference but it must be stressed that this is not the same thing as an academic study where all the material used as data may need to be preserved so if this sort of thing is intended to provide data towards meaningful and repeatable experimental work then advice should be sought. Other types of dung will we found eg. rabbit droppings are abundant on Croxley moor and deer droppings are seen throughout Whippendell wood, both are worth exploring. Books often quote certain species as occurring in certain types of dung or at certain times of the year but experience soon shows these species to be more 'flexible' than the literature would suggest. Winter sampling should not be ignored, although this can be frustratingly unproductive, as certain staphs occur only at this time and in any case over recent decades our winters have been mild enough to make this interesting. Many species take flight during warm days in early march, and many are active into december following a warm autumn so no time should be considered as not worthwhile. The great advantage of extracting beetles from dung, as opposed to trapping beetles by using dung as a bait, is that the vast majority of specimens can be released unharmed but it should be realised that extraction may be a very limited method if the object is to record the variety of dung frequenting species occurring in a given area. However thoroughly the specimens are extracted from a sample the results will only represent some of the spatial and temporal activity at that sample over some often unknown period leading up to its collection. Many problems could be overcome by planning a timetable of collecting samples at, say, different times of the day or from different parts of a field etc. but this quickly begins to involve a great deal of work and, in any case, once you are familiar with trying to capture e.g. Creophilus or Ontholestes around an almost liquid cattle dung sample, it will be obvious that such species are most unlikely to be recorded by taking samples of dung for extraction. On the other hand, trapping techniques can, by using dung as a bait be a very good way of retaining such specimens as well as just about anything else that turns up. 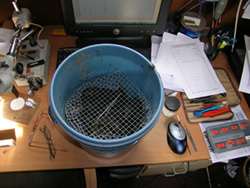 The number of specimens taken by such traps can be enormous; left for an hour or two on a hot afternoon a dung baited trap may attract hundreds or even thousands of specimens and this is a drawback of the method. Such samples will contain the complete range of species present however active or elusive they may otherwise be; staphs, hydrophilids, scarabaeidae and a whole load of other adventitious species. The trap will also contain LOTS of dung flies (Diptera, Scatophagidae and Sphaeroceridae) and parasitica as well as purely accidental things like Orthoptera and Hemiptera. 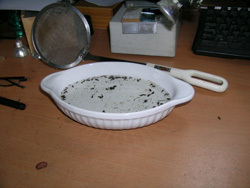 On a hot summer day these insects will be very active and so some method of retaining them within the trap is needed and this is generally water with an additive such as a drop of detergent or antifreeze to lower the surface tension. This will have no adverse affect on the physical condition of the specimens but it will drown them fairly quickly. 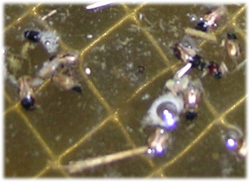 The option is to use the traps dry, very optimistically the traps may be packed with material that will provide places for the insects to rest such as is done with egg trays in a moth trap but this kind of thing will quickly be abandoned as really it only offers the larger staphs the opportunity to mutilate each other while everything else takes flight and escapes. Plain water will retain many insects for a while and the majority will survive but this is only a sensible option if the traps are inspected very frequently. The use of water traps should not be ruled out though; spending a few hours working dung pasture can be made more interesting by placing out a few unbaited water traps and doing the rounds every half hour or so. These traps need only be steep sided plastic bowls half filled with water and placed next to dung samples, insects will soon come blundering in. Different colour bowls may attract larger or smaller samples of insects other than dung species and this should be borne in mind. Dung baited traps are very easy to make and will take many more specimens, a dung sample is placed on a wire mesh resting across the top of an open bucket which is half filled with water, a couple of supporting canes may need to be placed across the bucket to support the weight, and the whole thing left in a likely place. Insects will continue to arrive for as long as the dung is attractive. Burying the bucket flush with the ground has the advantages that it will also act as a pitfall trap as well as help avoid the attention of the public. The disadvantage of this method is that the traps will need to be visited on a regular and frequent basis and it is very likely that they will contain large samples of insects; common species may be present in hundreds or even thousands and so some exploratory work should be done beforehand to assess the likely nature of samples to come. Working part-time to record the local fauna it is highly unlikely that one person would be able to cope with very many samples; before such trapping is performed it really will be necessary to perform a few brief and supervised trial runs in varying conditions so that you are aware of the potential work that might be involved. But the advantages are so great as to justify the work should one be dedicated enough to act in such a way. As well as revealing more of the variety of species occurring in a particular area traps can be used to demonstrate the successional nature of various species at a sample e.g. dung flies and some staphs may arrive within minutes of a sample being deposited and some of these staphs e.g. Tachinus spp., Oxytelus laqueatus, Philonthus marginatus and Aleochara spp. may within fifteen minutes be present in large numbers. Among the first dung beetles to arrive are usually Aphodius prodromus (Brahm), A. sphacelatus (Panzer) and A. rufipes (L.) along with species of the hydrophilid genera Sphaeridium and Cercyon (Gittings and Giller,1998). Among these early arrivals it is easy enough to demonstrate that some turn up at different times of the day to others e.g. A. rufipes (L.) is generally an evening flier. Aphodius rufus (Moll.) and A. ater (DeGeer) usually arrive when the sample is a little older and are referred to as mid-successional species while A. fimetarius (L.) and A. fossor (L.) are late successional species. A series of traps sited among dung samples of various ages and on various soil types may produce different species e.g. Sphaeridium spp. can exploit dung too wet for some other species, Cercyon spp. are more abundant in moister dung whereas some Aphodius such as ater, fimetarius and fossor prefer to oviposit in drier dung (Gittings and Giller ibid). Series of insect samples from baited traps may thus be used to record succession and temporal activity associated with a particular dung sample, seasonal occurrence of species can be demonstrated from a regular sampling regime and even movement of species can be followed if time allows. Dung traps should also be used away from dung pasture; sometimes the most ostensibly unpromising sites will yield dung species even though dung appears to be absent e.g. Cercyon Spp. develop in decaying vegetable matter generally while Aphodius prodromus (Brahm) and A. sphacelatus (Panzer) among others are known to develop on subterranean plant matter (Gittings and Giller ibid). 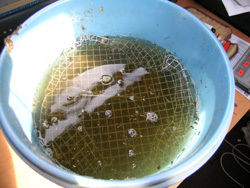 Taking the insect samples from these traps is simple enough; a strainer can be used to remove the insects from the water or, more thoroughly, the water can be poured through the strainer or a much better method is to carry a few pieces of nylon curtain type mesh about 25cm square through which the liquid can be poured, these can then be sealed along with the insect sample into small jars for later inspection, for convenience the sample data can be chinagraphed onto the base of the jars. This sort of sampling is at best a very powerful research tool for entomologists working at all levels, for the rather simple purpose of recording a local fauna all of the methods discussed will provide an abundance of material and a great deal to occupy the recorder. It must also be realised that at worst these methods can be highly destructive in terms of the numbers of insects they produce if they are not implemented both very sensibly and carefully and the effort to deal with these specimens is not made before the samples taken. When starting out and without guidance from a seasoned biologist it is very likely that a couple of samples, or even a single �good� sample will provide enough material for a whole winter�s worth of identifying and mounting and classifying and all the other stuff that makes entomology so rewarding, this will leave little time for all the other fantastic groups of beetles and methods ready to be explored so at first go and take the odd sample and have a good look at things in order to gain some expertise so that, when you do become obsessed with these intensely fascinating things, you will be better equipped to deal with them. � When running a moth trap in a west London garden in the 1970's I often recorded over a hundred species and more than a thousand specimens during a single night but unfortunately the data and lists have not survived. More recent trapping at the same site during may and june 2005 produced a maximum of twenty specimens of just six species. Gittings, T. and Giller, P.S. (1977). Life history traits and resource utilisation in an assemblage of north temperate Aphodius dung beetles. Ecography 20:55-56.